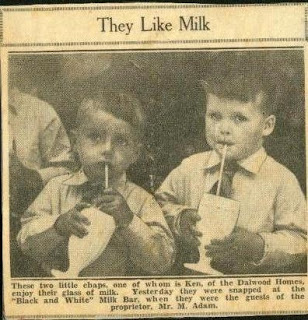 Greek migrant Joachim Tavlaridis, later known as “Mick Adams” opened Australia’s first milk bar in 24 Martin Place 80 years today. It was known as the “Black and White 4d Fruit Milk Bar”. The first of its kind, it featured a bar counter with limited seats on one side and milkshake makers and soda pumps on the other and spawned the opening of more than 4000 milk bars across the country within a few years. Tavlaridis’ grandson, Adam Gerondis, today owns the Moo Gourmet Burger restaurants in Bondi, Coogee and other Sydney suburbs, where among others the “Black & White Burger” is being served. Elsewhere in the world, Spanish forces ransacked Antwerp in Flanders during the Eighty Years War (1576), James Simpson discovered the anaesthetic properties of chloroform (1847), Phar Lap won the Melbourne Cup (1930), Iranian students invaded the US Embassy in Teheran taking 90 hostages (1979) and the first African-American got elected President of the USA (2008). As for birthdays, there are Italian painter Guide Reni (Bologne, 1575), Mary of Orange, eldest daughter of Charles I of England and mother of William III of England (London/UK, 1631) and Australian opposition leader Tony Abbott (London/UK, 1954). German composer Felix Mendelssohn died in Leipzig (1847) and the author of “Jurassic Park”, Michael Crichton also died on this day (Los Angeles/California, 2008).